The archmage Deldrammon disappeared decades ago, and his tower has since crumbled to ruin. Yet whispered rumours persist about an extradimensional lair where he conducted his most dire experiemnts. Such a place could hold magical secrets and eldritch danger - if it exists. The sudden appearance of a fiendish creature near the ruins of the archmage's tower indicates that the rumours may be true. 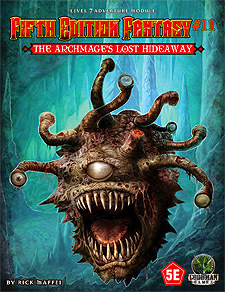 Dare the adventurers seek the archmage's lost hideaway?